Sunday Street Team has apparently become Monday Street Team, as I cannot keep up with dates. I need to get better at this. I promise I will! 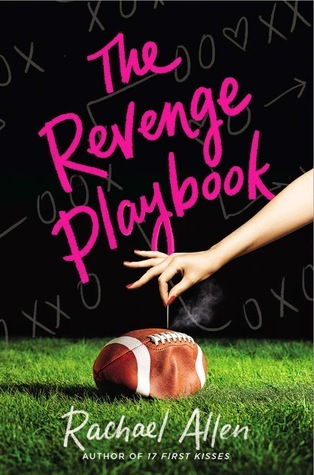 But lucky for you, I have a special interview with the author of The Revenge Playbook! 1. Is football your favorite sport? If not, what is? YES. I love all kinds of football. NFL football (Falcons Rise Up! ), College Football (Go Jackets! ), and flag football (I played all through college and grad school). I went to nearly every Georgia Tech home game when I was in college (and I got to watch Calvin Johnson play, like, every Saturday because he went there at the same time as me. Yay Megatron!). My favorite game ever was when we beat nationally ranked Auburn in a major upset when we weren’t even ranked and had a freshman quarterback. The entire stadium was electrified, and everyone rushed the field after the game and tore the goalposts down. To any Tech fans out there - what’s the good word? 2. Do you have advice for teens navigating high school themselves? I think my advice for teens would be pretty similar to my advice for anyone. Surround yourself with good people. Someone who makes you feel bad about yourself more often than they make you feel good about yourself isn’t someone you should be friends with, isn’t someone you should be dating. Think really hard about how people act: Do I like the way this person treats me? Do I like the way they treat other people? And when you find those good people, do everything you can to be a good friend back. I’m still best friends with the girls I met in college - I know we’ll be friends for the rest of our lives. Having these brave, brilliant girls be a part of my life is so important. We’ve been bridesmaids in each other’s weddings and held each other’s babies. We take each other to bars when someone has a break up and bake each other ugly cakes when someone has a birthday and throw each other epic going away parties when someone moves. We’ve been on Spring Break trips, camping trips, ski trips, more sleepovers than I can count. And when life makes me feel like I need someone to peel me off the floor, they’re the ones I call. That doesn’t mean we never fought. But a fight doesn’t mean the end of a friendship. Apologize when you’ve done something wrong. Tell someone when they’ve hurt you. Don’t lose someone important because you were afraid to try. Oh, and if a boy ever tries to keep you from spending time with your friends, he’s a jerk. Period. 3. Have you ever gotten revenge? How did you get it? Mostly just in the silly sense, like when I was little and would get into water balloon fights/prank wars/snowball fights with my friends and cousins. Like, oh, we’re at the pool and you splashed me? Allow me to CANNONBALL right next to you. And then he slapped me. Right across the face. Not hard enough to bruise or anything, but it definitely hurt. I was so shocked, I think I all I said was, “Did you really just slap me?” And then he was making this annoyed face and leaving with his friends, and I was making sure all my friends were walking home with me because I DID NOT want anyone going anywhere with him. I told my friends what happened on the way back to the house, and they were horrified. And then it got weirder. Because when we got back to the house, one of our other friends told us about how she had gotten slapped just last week at the same fraternity. We dubbed him The Slapper and decided he needed to be dealt with quickly and with vengeance. So, while he was no doubt feasting in pecan waffle heaven, we plotted his demise...I kid! We plotted how we were going to steal his fraternity shot glass from his room. It’s not like we put a hit out on him or anything. A couple weeks later, we successfully stole the shot glass, and it was a magnificent and perilous adventure, and we were the best spies in the world. When I think about it now, yes, we had fun that night, but did we do anything that resulted in him having any real consequences for his actions? No. And I think the girls in THE REVENGE PLAYBOOK have a similar realization. They have tons of fun spying on the guys and racing against them to complete the scavenger hunt - doing this stuff is what bonds them as friends - but they ultimately realize that changing things in their town is so much more meaningful than simply getting revenge. 4. Which of your characters do you most relate to? There are things I relate to with all the girls, but Peyton is the most similar to me in personality out of all the characters in this book or any other book I’ve written. I’m tenderhearted like she is, and I get super nervous about meeting new people even though I really love making new friends. But even though our personalities are really similar, I gave her very different interests and life experiences. 5. If you weren't a writer, what do you think you would be? A scientist! That’s my day job, and I love that I get to do diabetes research by day and write YA by night. Rachael Allen lives in Atlanta, GA with her husband, two children, and two sled dogs. In addition to being a YA writer, she's also a mad scientist, a rabid Falcons fan, an expert dare list maker, and a hugger. Rachael is the author of 17 FIRST KISSES.